When you’re a boy and you develop without a canine by your side, two things happen. First you pine for one – or at least, the romantic notion of one. There’s just something inherently mythic about a boy and his dog. That image marks so much of our pop culture – from Lassie dragging Timmy from a well to Will Smith’s trusted shepherd in I Am Legend. Hell, they even trained a pooch to cozy up to Jim Belushi in K-9 which as the lady folk will tell ya’ is no easy task. But, if you don’t grow up with one or at least within petting distance, another feeling grabs root. You begin to fear them. At least, that’s the path I followed. 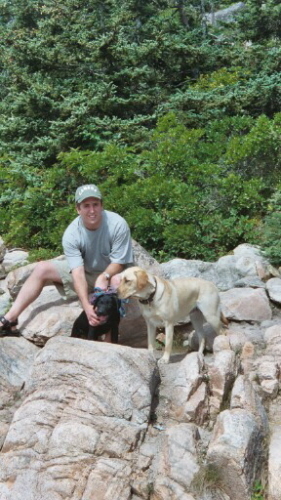 It took our two pups, the labs Abby (yellow – 11 years old) and Chatham (black – dearly departed last year), to cure me of my slight trepidation around the hounds. Sure, I’ve run across many kind mutts in my day and never once ran screaming from the site of my Nana Pearl’s precious pug Mischa, but until you actually own one (or a pair), you never really know just how fully integrated a dog becomes within your tight family unit. You’d die for them. OK – Maybe that’s a little too strong. At the very least, you’d never EAT them and that’s much more than I can say for a pet pig. This photo tells a thousand words. For most of Colin’s life, he didn’t care much for Abby or Chatham. Aria was the same. That’s not to infer that they were wary of them. They never feared them at all. It’s just they sort of took them for granted as household fixtures – roving coffee tables that sometimes bark. And as I would witness their limited interactions with the dogs – with their wagging enthusiasm met with indifference or a roll of the eyes – I began to fear that my kids would have the opposite experience from their Old Man. Where I grew up wanting a dog more than anything else, I feared they would grow up taking them for granted. That all changed. At some point, a few years ago – almost overnight – Colin and Aria stood up and took notice of Abby’s insistence on greeting us with a rubber bone in her mouth every time we entered a door – whether we had been gone all afternoon, simply stepped outside to grab the mail or took a little side trip to the fridge – especially when we went to the fridge!!! I knew the dogs had worked their charms upon them when they started giving them their own pet names – giggling like mad when they would call for the “Banana Dog” or the “Oreo Dog”. 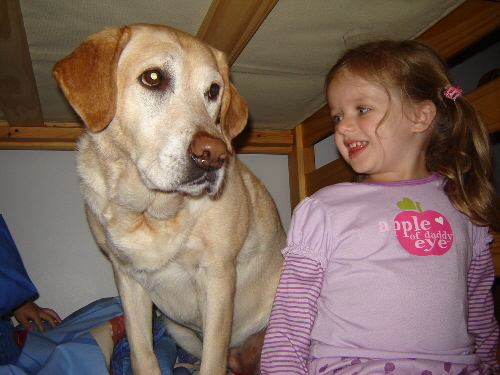 Colin used to claim that the Banana Dog was his (yellow being his favorite color) and the Oreo Dog was Aria’s – citing the age ratio between dogs and kids as about the same. I contend the dogs find themselves Alpha to every thing in the house with the notable exception of the one true King. 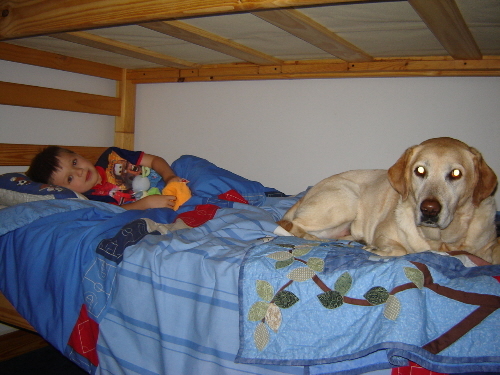 Since those days, the kids have taken on responsibility for dog care. They began to feed them and nowadays, Colin rises before all of us and makes sure Abby is fed before my feet ever hit the bottom landing an hour later. That’s bought me an extra hour of sleep as Abby used to always be the sole inhabitant to wake me – AND ONLY ME – every Saturday morning at 6 am sharp. With Colin on point, Abby goes looking for him and leaves me to the much needed rest. It ain’t easy being this beautiful. Sometimes you gotta’ work it. Over the last few years he’s been chasing fool’s gold – concocting supposed sure-fire schemes to get Abby to sleep in his bed. It’s not as easy as getting a cat to bunk down for the night – not with 70 lbs of Abby tabby taking up 3/4s of the bed when she achieves her full stretch. She’s booted me from my warm cocoon on several occasions and I just know she’s eye-balling his football pillow casing with fervent desire. Still, he continues to work at it. I shudder for the day when he laces that bedspread with Slim Jims. Watching them discover the dogs and more importantly, eagerly soak up the roles and responsibilities that come with pet ownership, has been a real joy. They seems to delight in grabbing charge and taking care of something other than their Zhu Zhu Pets – just one more step on that long, winding road towards independence. Never having had a dog, I had no idea what that act actually entailed. A boy and his dog just seemed like such a cool, mythic thing – like an Old West gunslinger with his faithful steed. The sight of a boy scampering alongside his bounding companion felt ripped from legend. Iconic – and something I definitely wanted a piece of. Never having had a dog, I had no idea how much responsibility they add. How you need to be real cognizant of their needs when giving the affirmative to every party Evite that comes your way. And weekend trips require particular sleight of hand to insure someone is nearby to feed them, let them out, and most importantly – spend some quality time just “shooting the breeze”. Human companionship comforts these canines. Never having had a dog, I had no idea how closely they become part of your life. How they define family. How they look at you, the second you walk through the door with all the love in the world – just grateful that you exist. Beyond grateful actually – a good dog is literally sent to the moon when you darken the doorway. And then there are those days, where you catch their eye at just the right moment, and you swear they’re about to speak their mind. Silly, I know – but there is an intelligence at work in these pups, the best of the great beasts that share this great Earth with us. And there are times where you just know they are aching to join the conversation. Of course, they’re likely to simply offer up “So, when are we eating?” but it’s intelligent thought all the same. Never having had a dog, I had no idea how good they could make you feel when it felt like the whole world conspired to bring you down. That sharp intellect is matched only by their massive heart – easily three sizes too big for their small frame. A good dog can lap those tears away. And protect you from the Big Bad Whatever that stalks us at those disparate and desperate times in our lives. Never having had a dog, I had no idea how quickly all felt right with the world when you caught them, rolled tighter than a ball – asleep and adrift on pleasant puppy dreams; their twitching feet, the only movement betraying their fantasy fox hunt. Spying your pup contentedly snoozing – and knowing that this good life they live is only made possible by your own pure love and devotion – well, that’s all the evidence you need to know that you’re doing something right in this life. Never having had a dog… I never had to bury one. But that’s exactly the lot I faced last May, as our family said goodbye to one of our own. And though there was a time when I could barely imagine the unbreakable bond that exists between a boy and his dog, that time is no more. It seems impossible, actually. 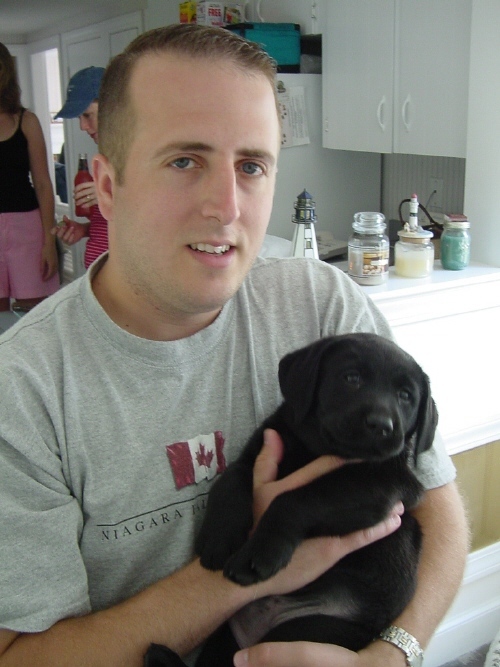 Eleven years ago, Andi and I welcomed a baby yellow lab into our fledgling family. Abby WAS and IS my very first dog. A year later, we decided there was room to grow – so we sought out the most precious second pup we could find. 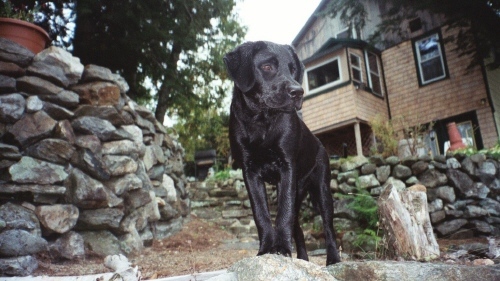 My first memory of Chatham is of a little inquisitive black lab puppy, standing atop a file cabinet drawer nosing around at everything on the breeder’s desk as he discussed the particulars involved in owning one of his prized labs. This was the same breeder we had gone to when we first met Abby and we knew we had found the perfect place to add one more mouth to feed. When we brought Chatham home, Abby had just hit her one-year birthday. 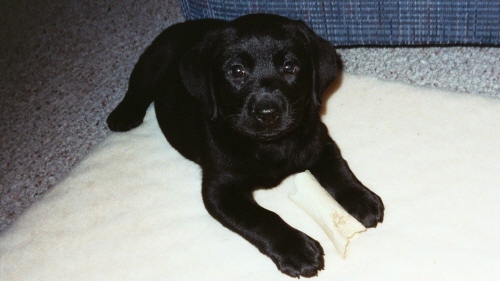 Though Abby WAS and still IS, a puppy at heart, Chats took one glance at the mammoth yellow lab living in her new home and from that day forth, looked at her like her mother. That bond evolved as they became “sisters” and “friends” – and in the context of our entire household, as we soon added a young human boy and girl to the mix, they were pack mates and above all else – family. There was no “Us” and “Them”. Just “We”. All of us, one in the same. I remember taking Chats to obedience class – a course taught by a woman described as “the best of the best”. It was rumored that she had trained the FBI’s finest canine cops. 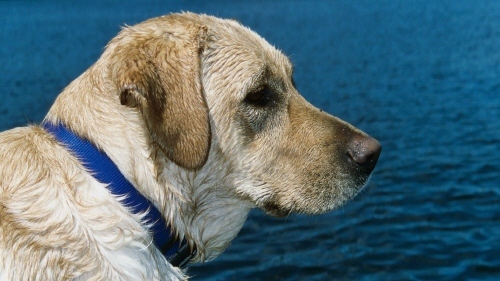 We were bound to get the most obedient lab in history by the time that final exam finished. Instead, we got a world champion cheese hound. This woman would cap each class by erecting a hurdle and having the dogs leap over the line to grab a cheese ball in mid air. Chatham may not roll over on command but she could leap a building in a single bound if it meant a Cheeto might be snatched in midair on the other side. We may not have received Best in Class but what we had living in our home was so much better. One of the sweetest, most gentle dogs a person could ever own. Sure – she had a reputation for wandering our house parties like a shark below the surface, skimming along until her mouth found an errant sandwich or Tostito dangling from a person’s relaxed paw. They’d retract their hand back up to take another bite and find they were noshing on air. Chats would be nowhere in site – slicing below the waves in search of her next smackerel. And if you ask Andi what her favorite time of day was – it had to be 10:00 p.m. when Chatham rose from whichever perch she had settled down in to roust Andi’s sleepy head and point her nose towards the bed upstairs. As I’m the night owl, more apt to come to bed much later in the evening, Chatham would steal an hour or two of bed time in my spot – waiting for Andi to get herself settled under the covers before Chats would hop up on the bed, take one or two passes in a circle around the surface, and then smash all 70 lbs of her weight into Andi. Then she’d wrap herself into a cozy, little ball. We called it “The Slam” – and once Chatham was down for the count, Andi would hug the world’s biggest teddy bear real close and drift off to sleep. It’s what she misses most of all now. The days get better as they grow longer but the memories don’t fade away. Not completely. It’s a hard thing to say goodbye to a human. When one of us passes, it’s crushing – shattering – the world just doesn’t seem as full. Sure, we move on. We live our lives. But a tiny void opens – one that only fills with tear-tinged memory. Memory of how good things once were. I find – now that I have buried a true friend and family member – that the same holds true for these precious pups. Their lives are so brief yet so full of everlasting love. They desire nothing but pure happiness. As I approach my 40th Birthday and take stock of the things that have brought me from Day One to where I stand now, I realize it’s not so much about what I have done or not done with my life. No. What’s most important is living each day in pursuit of that dream – a life built upon the simple pursuit of pure happiness.